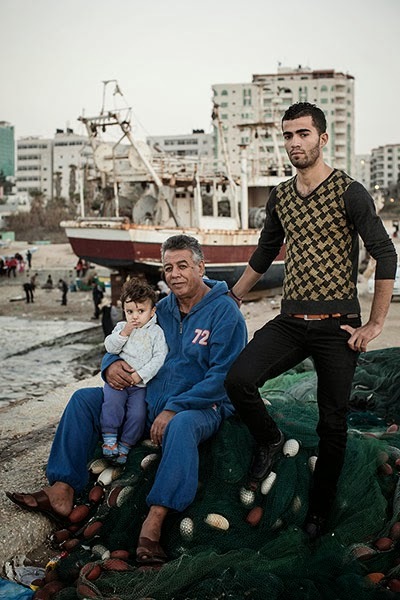 On 17 December, Palestinian fishermen and their supporters erected a tent — a traditional venue for protest, as well as celebration and mourning — inside the Gaza seaport. The protest, organized under the title Free the Holy Land Sea, ended two days later with the delivery of a letter to the nearby office of the United Nations Special Coordinator for the Middle East Peace Process, demanding international protection for fishermen. Over three days, hundreds of well-wishers visited a crowded tent decorated with banners and posters supporting fishermen. The organizations represented on its walls ranged from human rights centers to prisoner support groups. 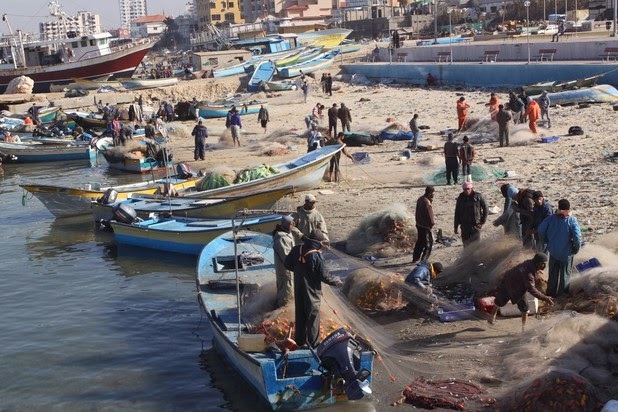 Palestinian fishermen in coastal waters off the Gaza Strip frequently come under fire by Israeli naval forces, which target their boats on both sides of a boundary imposed by Israel. Israel deploys its gunships into Palestinian waters using an information technology infrastructure administered by Hewlett-Packard (“Technologies of control: The case of Hewlett-Packard,” Who Profits, December 2011). Through its subsidiary, HP Israel, the US corporation won a contract to run the Israeli navy’s computer and communications network in August 2006 (“HP Israel wins navy IT outsourcing contract,” Globes, 14 August 2006). The fishing area permitted by Israel, which doubled in size as part of the ceasefire agreement ending eight days of Israeli attacks on the Gaza Strip and retaliatory fire by Palestinian resistance groups in November 2012, now officially reaches six nautical miles from the shore. But fishermen say the Israeli navy often shoots at them and sometimes captures them and their boats well within the zone it ostensibly allows them. 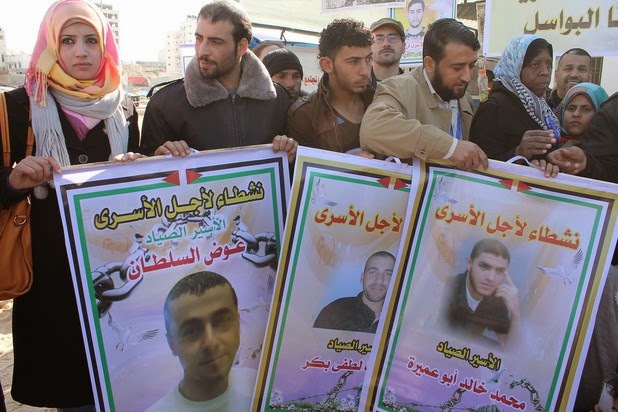 Fishermen and supporters hold posters with images of colleagues captured by Israeli forces, in Gaza City on 19 December 2013. “We were far from the prohibited zone, 500 meters away,” said Saddam Abu Warda, a 23-year-old fisherman whom the Israeli navy captured along with his 18-year-old brother Mahmoud around 9am on 10 November. When Abu Warda reached the Israeli gunship, he lost consciousness after soldiers bound, hooded and kicked him. He awoke in a detention facility in Ashdod, a port in present-day Israel beside his brother Mahmoud, whose right abdomen was stitched by military physicians. The brothers said that Israeli bullets caused the wound. After a lengthy interrogation that continued both in Ashdod port and after their transfer to a detention center by the Erez crossing between Gaza and present-day Israel, Israeli forces released the Abu Wardas into the northern Gaza town of Beit Hanoun around 10pm — 13 hours after their capture. Their boat and its equipment remained behind. “We have three hasakas in the Ashdod port,” Abu Warda said of his family’s prior losses to the Israeli navy. The Abu Wardas’ experiences echo many more documented in a new report by the Palestinian Centre for Human Rights (PCHR). The PCHR, which supported the Free the Holy Land Sea campaign, is translating the document — already published in Arabic — into English. Over four years, from 1 September 2009 through 31 August 2013, the Israeli navy killed two fishermen, wounded 24, and captured 147, according to the report. The navy also seized 45 boats and destroyed or damaged 113 more. The report also records the losses incurred by about thirty bombings of four fishing ports during Israel’s November 2012 attacks on the Gaza Strip, including damages to an additional 80 boats and destruction of a health clinic and a youth center used by fishermen. Casualties have continued to mount in the four months since the period covered by the report ended. The PCHR publishes regular reports on human rights abuses in Gaza. These reports indicate that Israel has shot at fishermen at least 37 times since September, as well as seizing six boats. “I would like to thank all the solidarity campaigns who were involved in this action and show solidarity with Palestinian fishermen,” al-Shrafi said.